Village residents from the Rostov region of Russia caught a weird creature two weeks ago after a strong storm in the Sea of Azov. The shark-looking creature was producing strange squeaky sounds. 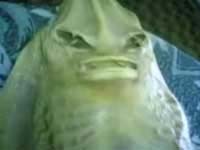 The fishermen originally believed that they had caught an alien and decided to film the monster with the help of a cell phone camera. The footage clearly shows the creatures’ head, body and long tail. The bizarre catch was weighing almost 100 kilograms, the Komsomolskaya Pravda reports. However, ufologists and scientists were greatly disappointed when they found out that the fishermen had eaten the monster. They said that they were not scared of the creature so they decided to use it as food. One of the men said that it was the most delicious dish he had ever eaten. Chairman of the Anomalous Phenomena Service, Andrei Gorodovoi, stated that the creature, which he could see on the short video, was an anomalous being. However, it could hardly be described as an extraterrestrial form of life, he added. Gorodovoi rejected the version about mermaids too. “There are many legends about mermaids living in the Sea of Azov. Nevertheless, specialists of the Service for Anomalous Phenomena have never confirmed those fairytales. On the other hand, we do not deny the possibility of other forms of life in the Sea of Azov,” the ufologist sad. A spokesman for the Rostov-based zoo, Alexander Lipkovich, contacted local ichthyologists and asked their opinion about the Azov alien. “They said that the fish bears resemblance to a sturgeon. It was an extremely interesting individual. I have never seen anything like this before in my whole life,” the specialist said.